Plain and Simple’s roving reporter/man about town and clubbing addict Jammy brings you his eye view of the events he was shuffling at in the last week… This time he spent his jaunts at COMA, Fabric, Jaded and Void! Hey and welcome to Jammy’s Jaunts! A weekly round-up of my weekend’s proceedings. This weekend consisted of Coma presents London Techno Champions Part 2, Fabric, Jaded Afterhours at Cable and finishing up with VOID at 1001. So to start off the weekend, I began my Jaunts late on Friday after celebrating the end of my school year! I got down to the Horse and Groom in Shoreditch around 2am and the place was already packed. The first room had a separate night going on in there and the Coma night occupied the upstairs room. The headliner was Ventress alongside Setaoc Mass and resident Doubleffe. Setaoc Mass 22:45 – 00:45, Ventress 00:45 – 02:45, Doubleffe 02:45 – Close. Unfortunately I missed Setaoc Mass, but as I managed to work my way through the crowd, I eventually managed to catch the last part of Ventress’s set. His debut in London and pretty much did the business there. Techno of the highest order. In my opinion, I don’t feel like the Horse and Groom really suits Techno as I still feel it’s more of a pub than an actual club suited to Techno etc. But anyway it seemed to work and the crowd were really up for it! Closing the party was resident and founder of Coma: Doubleffe. He blended his original sound of techno following Ventress and it was good to see, as it was my first time at a Coma party and also the first time seeing Doubleffe and Ventress play. It was nice to see another night (Techno) beginning to take off in London, when we all know how difficult it is to put on a party and to make it successful in this day and age. I was pretty tired after that, as I was out earlier celebrating but more was to follow tomorrow! The next stop was Fabric on Saturday. This was kind of a last minute trip that I planned with a friend and was more of a social research trip! Regardless, the lineup wasn’t Techno, as I love all forms of electronica. But Techno is my passion. So anyway I really wanted to check out the line up in room 1 which is basically where I stayed the whole night. 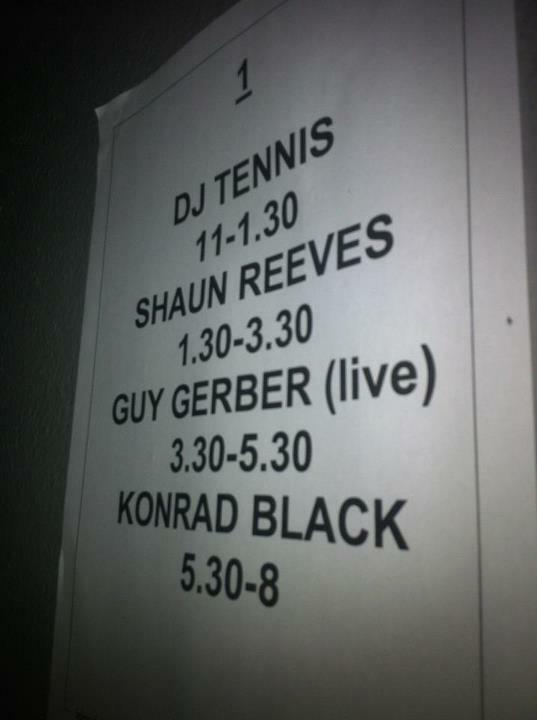 These are the times: DJ Tennis 23:00 – 01:30, Shaun Reeves 01:30 – 03:30, Guy Gerber (Live) 03:30 – 05:50, Konrad Black 05:30 – 08:00. I managed to catch everyone apart from DJ Tennis and Fabric again was impressive. Shaun Reeves in my opinion is the most talented alongside Ryan Crosson in the Visionquest family and his 2hr set flew by with his intelligent, infectious tech house that played through the room 1 sound system. It was absolutely devastating! I remember last year when VQ played at fabric, his set then, was the best warmup I heard that year and again he didn’t disappoint on Saturday. He really left me wanting more and this set up Guy Gerber (live) perfectly well. Saw Gerber last year as well and he just exudes coolness and throughout his 2hr set it was pretty incredible the way he kept the crowd going. He was one of the true highlights this weekend alongside Konrad Black who played later on. Constantly creating beats on the fly for 2hrs is a real testament as to how talented he is; originating from Israel alongside fellow DJ’s Shlomi Aber and Guy J. The balcony room was taken over by the Cartulis Day duo and Jaded residents: Alex Cliche and Unai Trotti, and headlining was British born Ed Davenport – an added bonus of seeing him play for the first time and another one to add to my DJ list! 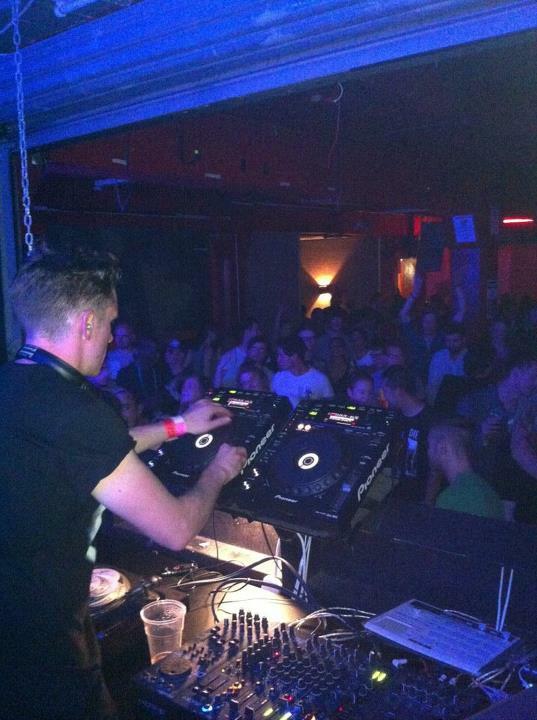 Rounding things off was Jaded resident Chris Stanford.. Another brilliant Jaded! Can’t get much better than that! A bit of chill time ensured after Jaded and my last port of call for the Jaunts this weekend was VOID at 1001. This collective of Techno enthusiasts have come a long way from their humble beginnings at Public Life and after Ben Klock and Tommy Four Seven played for VOID a few months ago, it was time again for VOID to return to their new home at 1001. This time it was the residents party and on a sunny day in Brick Lane the area was packed. I arrived quite late and the queue to get in was already pretty long. I managed to catch the last part of Jay Clarke’s set, a good friend of mine going way back. He kept the crowd going right till the end and it was a pleasure to see this. A definite talent to look out for. 1001 was full and very hot and sweaty inside and the party kept going until 1030pm. Nice to see all the Techno heads of London at 1001 as well as everyone I saw this weekend. Felt exhausted but was well worth it! What a weekend! Same time, next weekend?! Jammy’s Jaunts: 11.01 – 12.01 – RBMA Presents LFO at XOYO and Mooch at Basing House.